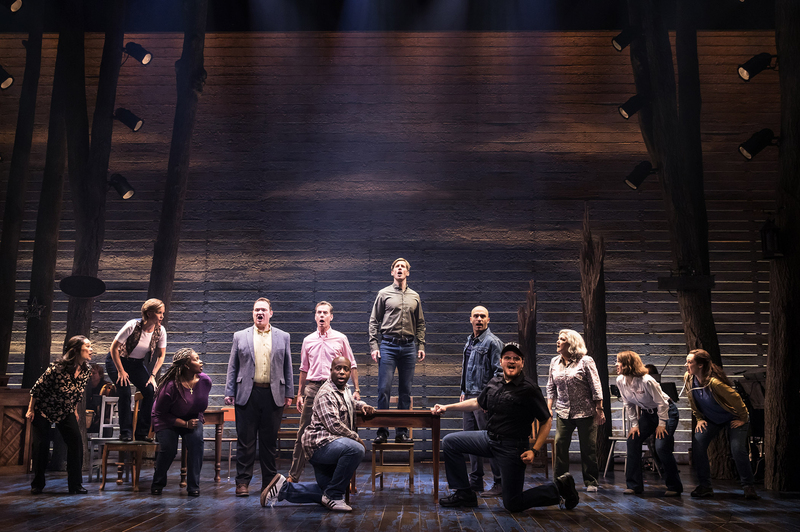 SHN’s Touring Company of “Come from Away” shows what happened to passengers in the air after 9/11, when all the U.S. airports were suddenly shut down. It’s the story of 7,000 airplane passengers forced down and stuck for five days in the small town of Gander, Newfoundland, a Rock far away in the Atlantic. David Hein and Irene Sankhoff’s musical concentrates, brilliantly, on the passengers of one giant American Airlines plane—with 12 actors playing all the passengers. And those same talented and versatile actors also play their surprised, nearly overwhelmed Canadian hosts, too. From the Mayor (remarkable Kevin Carolan) to the bus drivers’ union chief (impressive Andrew Samonsky) to the Head Shopper (powerful Julie Johnson), all the Gander-ites worked hard to help thousands of stranded international voyagers. 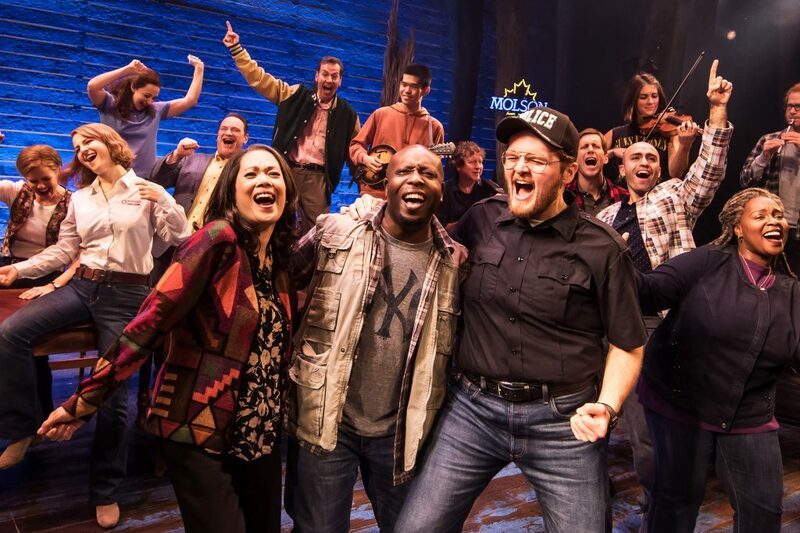 “Come From Away” offers remarkable and masterful staging. The superb actors slip seamlessly from passengers to townspeople—making each role distinct and delightful, poignant and playful. Why can’t we all be like these generous Canadians? What a joy to watch them organize themselves in a spirit of inexhaustible humanity and hospitality! 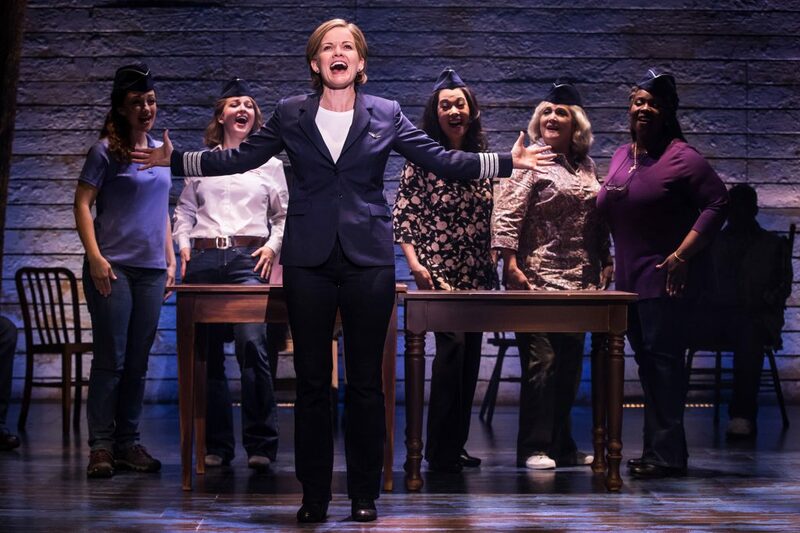 Airline Captain Bonnie (lively Megan McGinnis) exhorts and comforts her passengers in two rows of chairs. They’re afraid, have no news, and want to know why they are landing on a rock in the middle of nowhere. The Mayor mobilizes moms and dads, firefighters and drivers. They scatter, hilariously, collecting bedding, water, sandwiches, diapers, trapped animals…. you name it! Chaos threatens but Newfoundlanders blossom. They even make fun of themselves, their drinks, and their yellow seafaring hats. Nick Duckart, Kevin Carolan, Andrew Samonsky & Company. Many kinds of people—from England, the Sudan, Syria, Dallas—praying to their gods, losing love and finding love—all the emotions of 9/11. 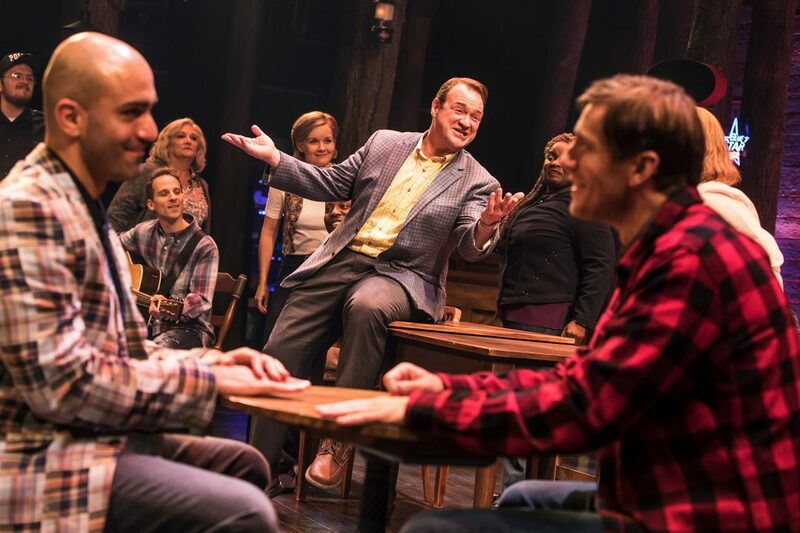 A witty gay couple (Nick Duckart and Samonsky) come to grips with their differences, while an Englishman finds love with a sweet Texas lady (Chamblee Ferguson and Christine Toy). Meanwhile, a mother worries about her fireman son at the Twin Towers, while she makes a lifelong friend in Newfoundland. A Muslim chef offers to improve the food (Duckart), and a Sudanese visitor worries about his family (versatile James Early Jones II). All the world is there. The actors pull it off with wit and charm, changing accents, changing roles. They create patterns and shapes against a rugged stone wall, set with Northern pines and a fascinating colorful lightscape. In a moment’s transformation, each actor glides in and out of being lovable, screwball townspeople and then, anxious, stranded travellers. 9/11 has spread fear and humanity over the world. Step by step, we get inside the skin of these amazing Canadians who offer everything they have with such grace and hospitality that it blows us away. I want to be a Canadian, too. After all, when the U.S. is shut down, there’s always a Newfoundland. 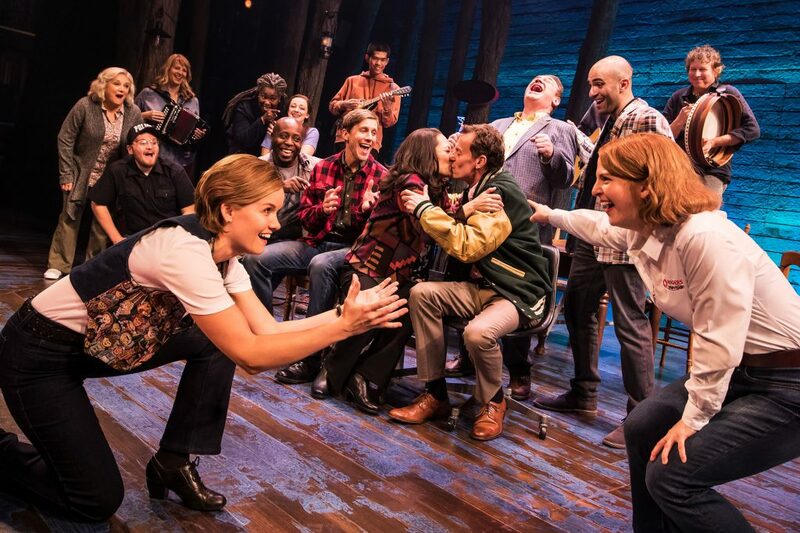 Join them all in Gander for a rousing, compassionate musical—with gut-stirring songs and abundance of love. Cast: Megan McGinnis, Harter Clingman, Becky Gulsvig, Emily Walton, James Earl Jones II, Kevin Carolan, Andrew Samonsky, Chamblee Ferguson, Nick Duckart, Marika Aubrey, Julie Johnson, and Christine Toy Johnson.